Mr. Siamese is a rescue kitty found in the lot of a Middle Tennessee drug store. 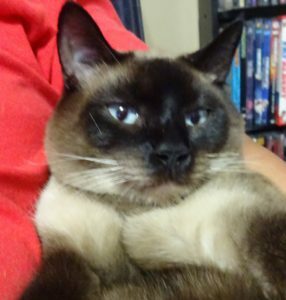 Mr. Siamese was spotted and posted on Facebook on a lost / found pets page. Mr. Siamese was found in a feral colony but was not like the others. He was very friendly and walked right up to people. Mr. Siamese was fostered while people looked for his owners on Facebook, posted signs, and knocked on doors. After weeks of no success, Mr. Siamese settled into a foster home where he enjoys himself to this day. Mr. Siamese eats Purina Cat Chow Dry Cat Food which keeps him healthy and strong! Mr. Siamese seems to sleep in the most uncomfortable looking poses including ‘paws up’ and upright. Mr. Siamese must have a past but it is a bit of a mystery. Was he left at the drug store? Did his people pass on at a nearby retirement home and Mr. Siamese was simply released? Did Mr. Siamese escape accidentally and his people never located? Mr. Siamese has a secret story and maybe one day we’ll find out what it is!